The U.S. Federal Trade Commission has taken steps to shut down another company promoting a fraudulent work from home business opportunity. The FTC filed a lawsuit charging the company and leaders for bilking more than $125 million from thousands of customers. I looked at the MOBE business opportunity a few years ago. Fortunately, I did nothing more than look because I noticed several red flags. More about this later. promoted the MOBE business opportunity as risk-free and included a money-back guarantee. MOBE is an online business training program. MOBE offers a variety of training packages designed (or claimed) to provide everything needed to operate a successful business online. The training is provided in a variety of ways including one-on-one mentorship, videos, seminars, and retreats. One of the main products is the licensing rights to sell the MOBE high-end products. MOBE members who sell the big-ticket products can receive commissions of up to 90%. Several of MOBE’s competitors are no longer in business. The FTC shut down Digital Altitude, LLC through a court order. Empower Network went bankrupt due to accounting fraud. Yet, there are other MOBE competitors promoting big ticket training programs such as Legendary Marketer. Corporate, management, marketing, and other business training is a BIG business. As a former member of the American Management Association, I know that their training events can be very expensive. So it is difficult to assess the value of the MOBE training. I did not take any of the training courses. So I don’t know. 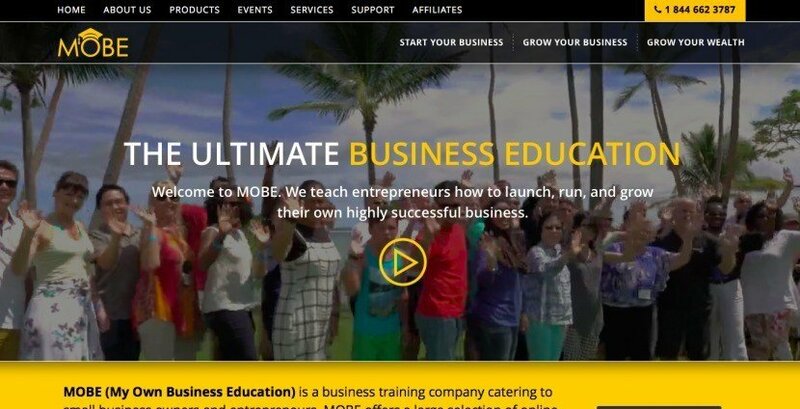 MOBE was focused on recruiting more people to become affiliates and promote the training program than selling training courses. And affiliates had to pay to play. They had to buy the training products in order to sell the products. But selling a $2,000 training course is harder than selling a $20 widget online. Yet, MOBE was touting their program as a risk-free, get-rich-quick scheme. An average person is not capable of selling a high-end product online without extensive training and experience. Experienced marketer Neil Patel explains the lessons he learned from spending $400,000 on Facebook ads. This is certainly not something an average person can swing. I can understand the desire to work from home. I think we all have thought about the idea of working from home and making a pile of cash. And if you have ever searched for a work from home business opportunity on Google, you have seen the wild claims and get-rich-quick schemes. I don’t remember what led me to MOBE. But out of curiosity, I did some research and asked for information. I was put into contact with one of the MOBE affiliates, who walked me through the initial phases. He also told me about the 21-step system, which he claimed was simple. Maybe the 21-step plan was simple to him. But certainly not to me. Especially, the part where he had to “sign off” each step I completed. Here is RED FLAG #1. MOBE had a low-cost point of entry. As I recall, it was $49, or at least below $50. I have been around long enough to expect upsells. They know if you are willing to pay to start, they can convince you to pay more to continue. Had I paid $49, then I could recruit and sponsor other people willing to pay $49. The trick, which they don’t tell you, is to find enough people willing to pay $49 that some would be willing to pay more. There are people willing to try something for $49. But not so many that would want to pay more to continue. They were promoting MOBE training as a sure-way to create 6-figure retirement income in 12 months. I did not just fall off the turnip truck. I know of a guy who made $1.6 million online in one year. He did not tell people that he spent $600,000 on advertising. Also, I have socialized with million-dollar earners. None of them made their wealth overnight. It took years of hard work. These warning signs, in addition to the red flags above, show you how to avoid being scammed and ripped-off. During the last 20 years or so, I have seen and been the victim of a few scammy programs and worthless products. I have wasted time and money buying bogus products. FIRST AND FOREMOST, as I always tell people, do not commit money or pay more than you can afford to lose. If they do not accept PayPal for payment, it is a good bet they are not a legitimate program. PayPal is a major online payment processor. PayPal has very strict guidelines related to multi-level and network marketing companies. If there is a hint that a company is a scam, PayPal will not approve their business account. Don’t accept any excuses from a company representative as to why they don’t use PayPal. If there are pictures of money, expensive cars, and homes (ostentatious display of wealth), it is most likely a scam. The intent of the pictures is to create an aura of success and credibility. If the sales page offers an endless stream of free bonuses usually with inflated estimates of value, the product being sold is probably worthless. If a product is that good, there is no reason to offer a bunch of bonuses. However, marketers may make offers as incentives to buy such as Buy One, Get One (BOGO) free or for the cost of shipping. If the program promotes a get-rich-quick program where no work is involved (they do it for you), run fast and far away as possible. If there is no work involved on your part, why do they need you? They don’t. Just your money. If there is an extremely low cost of entry, there is a high probability that there are big “upsell” costs lurking behind the initial cost. $7 and $17 appear to be popular price points for these scammy programs or products. If the product is marketed at a low cost, has a long guarantee period and is marketed through one of the affiliate networks, be careful as the product may be of questionable value. I, personally, have had more problems getting refunds from sellers who use JVZoo to market their products than Commission Junction, ClickBank, and some others. Don’t get me wrong, I have had great success with some JVZoo affiliates. And, finally, the video or PowerPoint Presentation only website may be a scam or promotion for a worthless product. These are the sales pitches “by the number” used by either incompetent marketers or scams. The intent is to create curiosity, interest, and desire on part of the viewer to watch until the end to make a purchase. Some of these “presentations” can run 30 minutes before you know what the product is. Before starting any online or work from home business, I always encourage people to learn first. There is a wealth of knowledge online for free. Also, I am a big fan of SCORE, a non-profit organization dedicated to providing free information and helping small businesses be successful. If you have any questions or comments about this blog post, please fill in and submit the form below. I love feedback. Great job yet again Glen, one posing these scams for what they are. Anything, anything at all that requires you spend money in such fashion, should be carefully reviewed. While education always has a cost, paying to sell it should raise a red flag. There are many tried, true and proven direct sales businesses out there…but people need to be very very careful before making a decision to proceed. Homework is key! Thanks, Jason. I appreciate you taking the time to read and comment! I agree that homewrk is key! There should not be a rush to join anything. It’s sad that there are so many get rich quick schemes such as MOBE. The FTC needs to be more aggressive with these types of companies. We all would like to be an entrepreneur to have our own successful online business that we can run while staying in the privacy of our home. And these fraudulent companies take advantage of this. How long has MOBE been around? It is sad. MOBE started in 2012. Companies like MOBE take advantage of people by making promises they can’t or won’t keep. And they take advantage of people’s naivety and greed. The first rule of investing is do not commit more money than you can afford to lose. YES! Finally, ohh its such good news that FTC brought them down. I once joined MOBE and I didn’t like how everyone’s pressuring me for not making enough money. It didn’t feel right and so I left and still, some of those MLM junkies send harassing text like “Im not fit for success” and all that rubbish. Now with FTC’s taking action, they’ll get what’s coming. Thanks for sharing your experience with MOBE, Riaz. That’s unfortunate that people would harass others for making decisions in their best interests.